Happy National Cheesecake Day! To celebrate, we’re jumping on the overnight oats bandwagon with this strawberry cheesecake recipe. Simply mix the ingredients together, let them soak overnight and bam! You’ve got a delicious, nutritious breakfast waiting for you in the morning! Or, for all you dessert lovers, use this recipe as a healthy alternative to actual cheesecake and enjoy a few bites after dinner. We recommend using Best Protein™ in Vanilla Swirl or Strawberries & Cream for the protein powder. Place strawberries, almond milk and Greek yogurt in a food processor and puree. Transfer mixture into a large bowl and combine the rest of the ingredients (minus graham crackers and jam, if using). Divide mixture into serving containers (i.e. mason jars). Cover and place in the fridge overnight, or at least 2 hours. Top with crushed graham crackers and strawberry jam (optional). Serve. 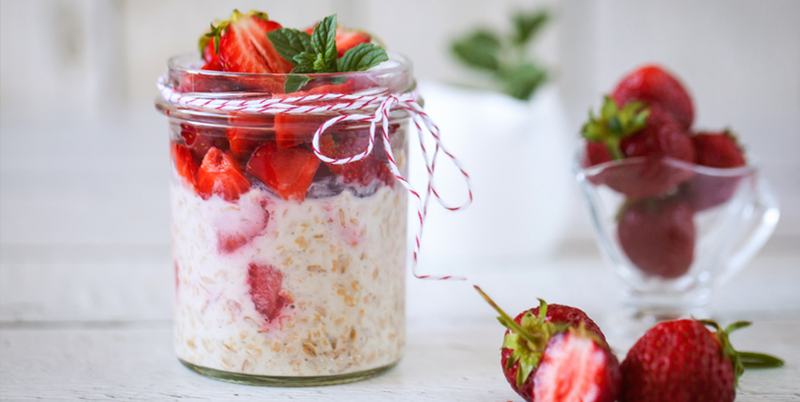 Your strawberry cheesecake overnight oats will stay good in the fridge for up to 3 days.